Your adventure awaits. Relax, unwind, and enjoy the beautiful Pacific Northwest at The Coeur d’Alene Resort. Play a round of golf at the Coeur d’Alene Resort Golf Course, home of the world-famous Floating Green. Rejuvenate your body and mind with the water, cedar and stones at The Spa Coeur d’Alene. Experience exceptional dining, nightlife, scenic tours and seasonal activities. However you choose to spend your stay with us, the journey is yours to create. 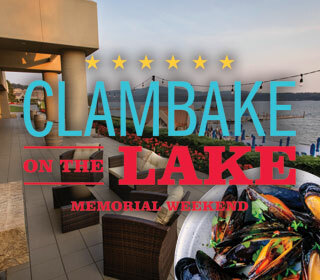 We invite you to enjoy beautiful Coeur d'Alene lakeside surroundings, luxury amenities, a wealth of activities, and a service staff second to none on your Coeur d'Alene vacation. Built along the shores of Lake Coeur d’Alene, The Coeur d'Alene Resort Golf Course, home of the Floating Green, ranks among the most spectacular in the world. Designed by TAG Galyean, our three-level spa is a spectacular setting of waterfalls, fountains and fireplaces. Experience the sights, sounds and tastes of Coeur d’Alene’s grandest traditions—including competitive races, auto shows, food, wine and beer festivals, music festivals and holiday lights. Our fleet offers fun-filled cruises throughout the year—from scenic tours to sunset dinners, themed seasonal and holiday light show cruises, chartered events and more. Take to Lake Coeur d'Alene in the summer with rental boats, water sports and scenic bike tours, or head to the mountains for winter skiing.